Pythoff effectively sterilises nutrient solutions and hydroponic systems, killing parasitic organisms, diseases and fungi that cause root-rot, particularly pythium. Routine use off Pythoff will guard against root-rot getting into your system. Pythoff can also get rid of root-rot in an infected system and can even save your plants as long as they are treated early enough. Used as directed, Pythoff will sterilise all surfaces that it comes into contact with including reservoirs, pumps, feed-lines, drip-lines, drippers, substrate, roots and drain-lines. Pythoff is designed for use in hydroponic systems but it is unsuitable for use with coco-peat, wood-chip or soil-mix substrates as it kills the beneficial microbes in them. Add 2 ml of Pythoff per 10 Litres (use only half of this dosage for sensitive or weak plants) of reservoir size into 1 Litre of nutrient-free water and mix well. Add the dosed litre of water to your reservoir slowly over 30 seconds while stirring the nutrient solution. Immediately run the pump for 15 minutes to sterilise your hydroponic system. If organic additives are being used then wait at least 20 minutes after adding Pythoff before adding them to the reservoir. Re-dose your system once every 7 days. If being used to treat an on-going root-rot infection, discontinue the use of the organic additives and dose the system with Pythoff every day. For small, sensitive plants (e.g. lettuces, seedlings) use half of the stated dose. 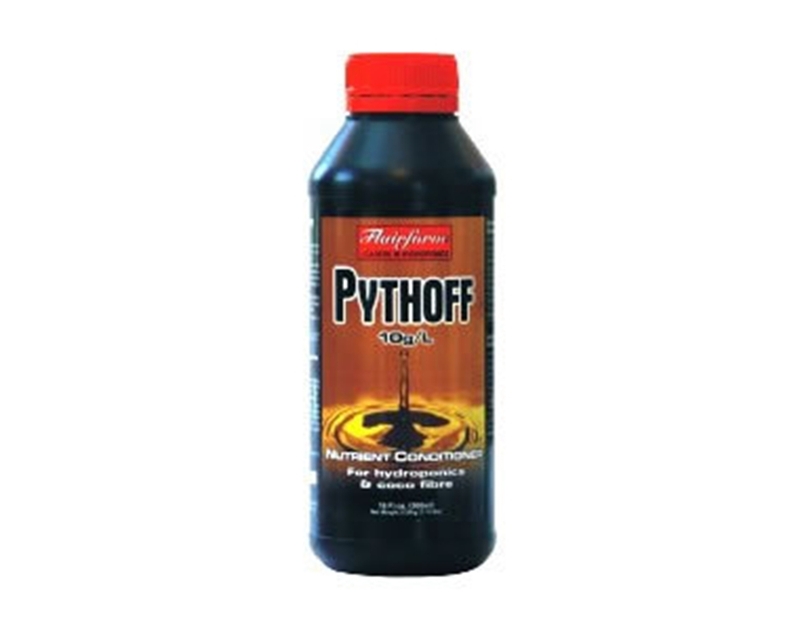 Pythoff is not compatible with beneficial bacteria/fungi additive products as it will kill the organisms in them.